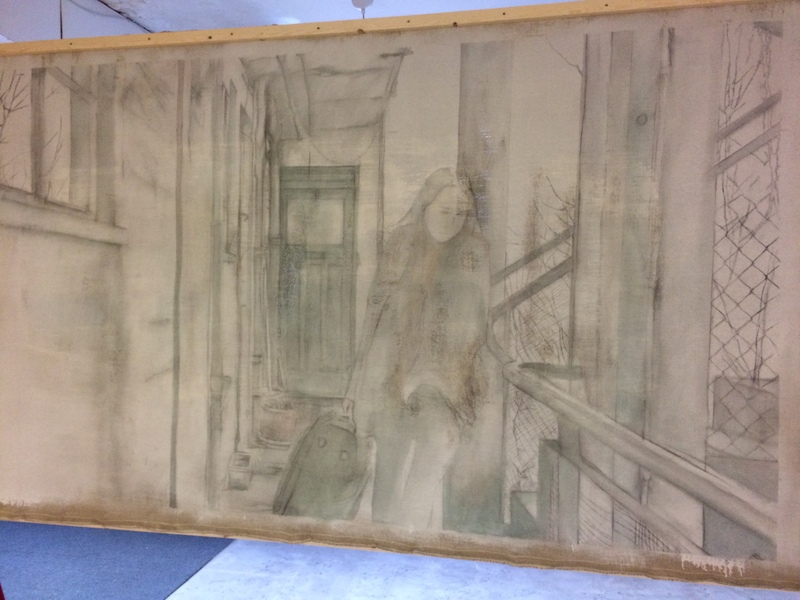 On Friday 26th April I had the absolute pleasure of attending ‘you have got my bone,’ an exhibition organised by Pascal Colman (Westminster), Alice Howard (Slade School of Fine Art) and Olivia Bladen (UCL, ArtAttack), which closed on Saturday after a week-long run. The show took place over three floors at the old Foyles bookshop in Charing Cross, and as I wandered through the exhibition, level after level, taking it all in, I couldn’t help but think how lucky I was to have made it back from LA in time to see this. 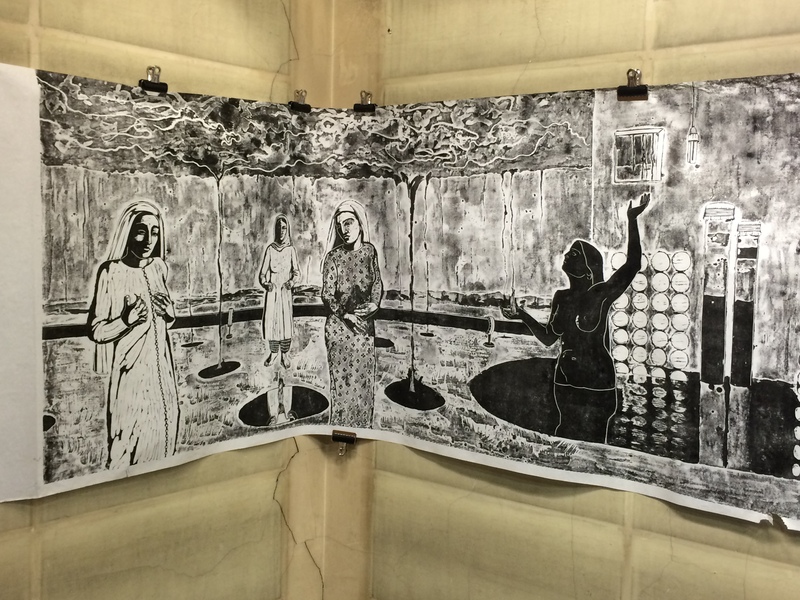 If you read this blog, you know my fondness for student-run exhibitions, but I must admit this particular attempt was unlike any other I’ve seen. Artist and exhibition director, Pascal, came across the former bookshop by chance on a walk, and seeing how empty the space was, inquired how much it would cost to rent for a week’s time. He and friend/Artist, Alice, then worked out that with enough artists participating the cost would be next-to-nothing, and so they went for it — inviting their peers, friends, and any artist who desired, to put up work in the show. There were no parameters for the art whatsoever except that the space had to be left in the condition in which it was found. 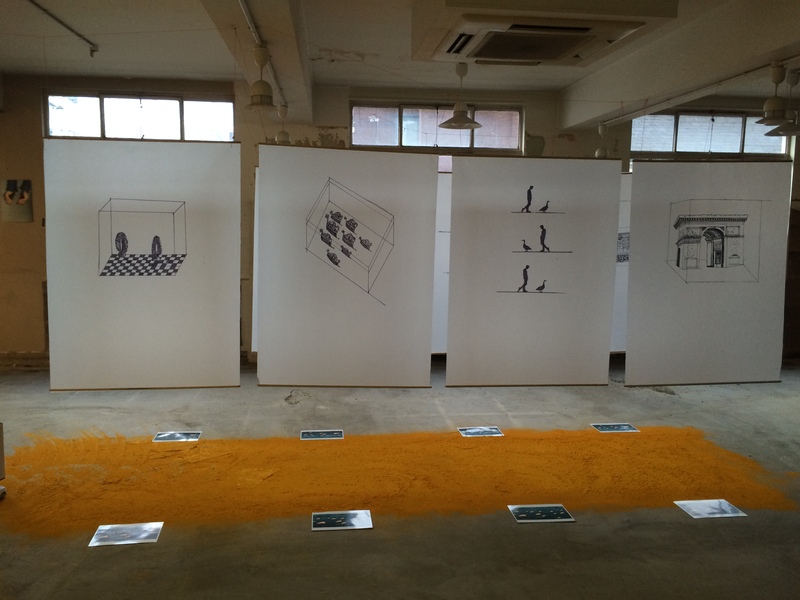 Of course, here we hit upon another another ArtAttack favourite — open exhibitions. From painting, to sculpture, installation, performance and poetry, it seemed almost as though not a genre was missing, and somehow, despite the no boundaries format, the work all fit together. 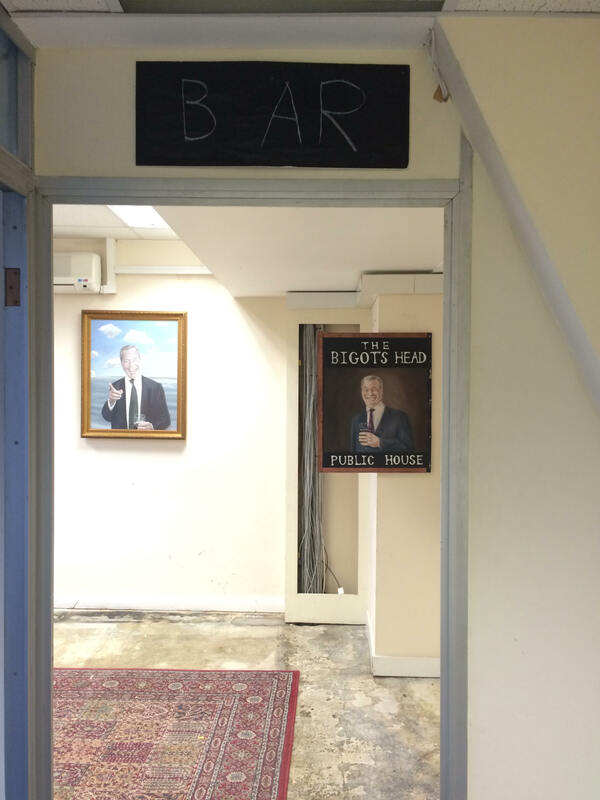 A real highlight overall was ‘The Bigot’s Head,’ a Nigel Farage themed pub, set up in one of the anterooms. 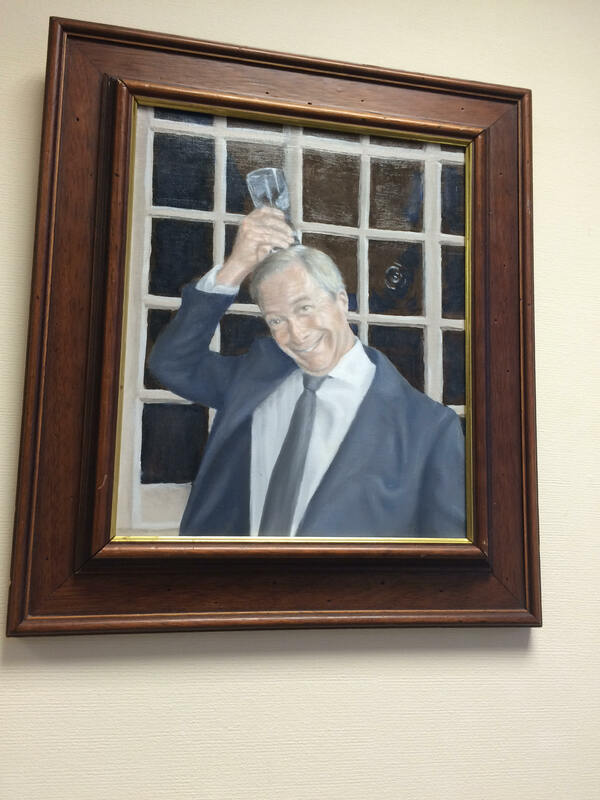 This immersive piece, by ArtAttacker and Slade second year student, Jake Lamerton, featured paintings of the UKIP star flaunting his wide-tooth smile and just looking generally goofy. 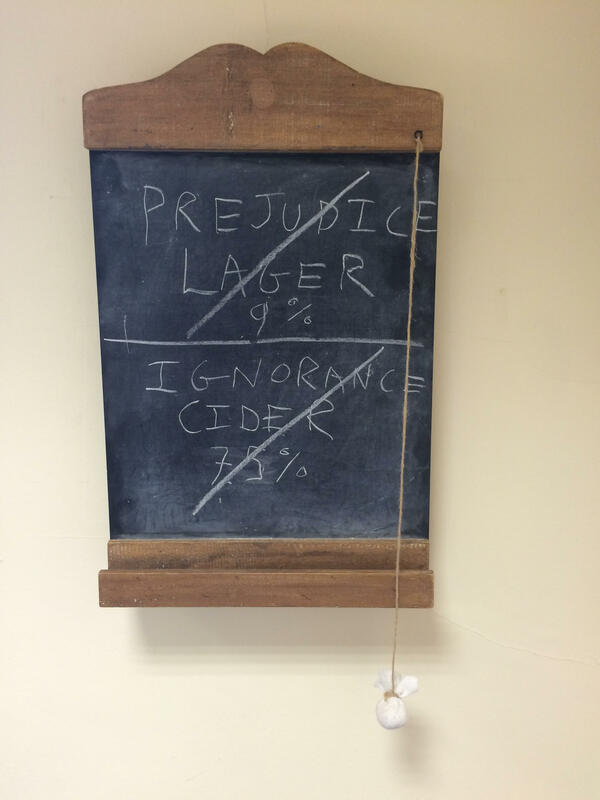 A bar lined with stools invited viewers to have a seat amongst it all, offering a menu of Prejudice Lager and Ignorance Cider. I think this would be a fantastic piece to tour the country — imagine pub-on-wheels, meets political satire. meets art — what could be better? I must admit this has to have been my favourite work of the exhibition, combining humour, irony and politics, it was a wonderful reminder of the power of art. 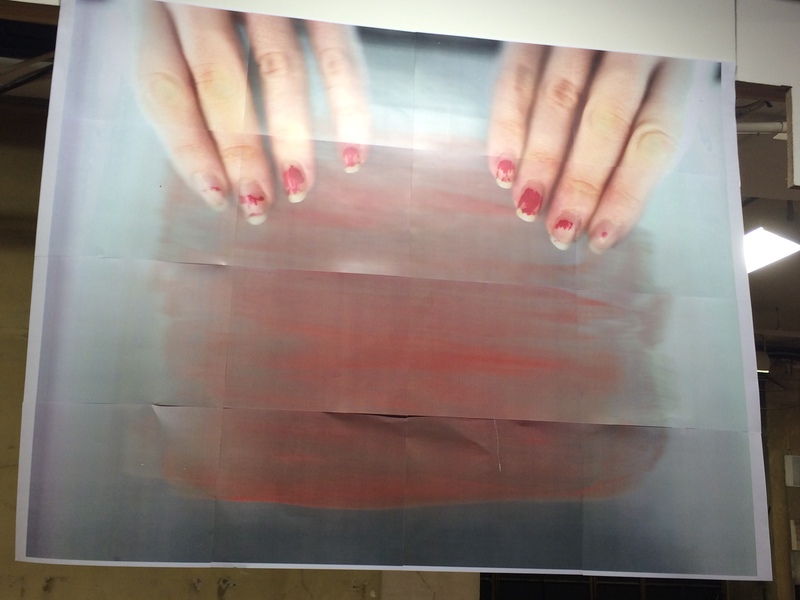 Another moving work, was a pair of red-manicured hands by Bryony Hussey. The chipped polish of the subject matches the splotches of red beneath her fingertips, evoking the idea of blood and pain. There were some splendid drawings as well, which I found particularly exciting due to their large size and thoughtful detail. One of the installations distinctly reminded me of a Moroccan art show I attended at L’Institut du Monde Arabe in Paris in the early 2000’s. The sand-like powder on the floor was the colour of saffron and framed the simple, black and white, works hanging above it with such finesse. This work in particular, felt miles away from a shoe-string budget exhibition, and could have been placed in any posh gallery and held it’s own. 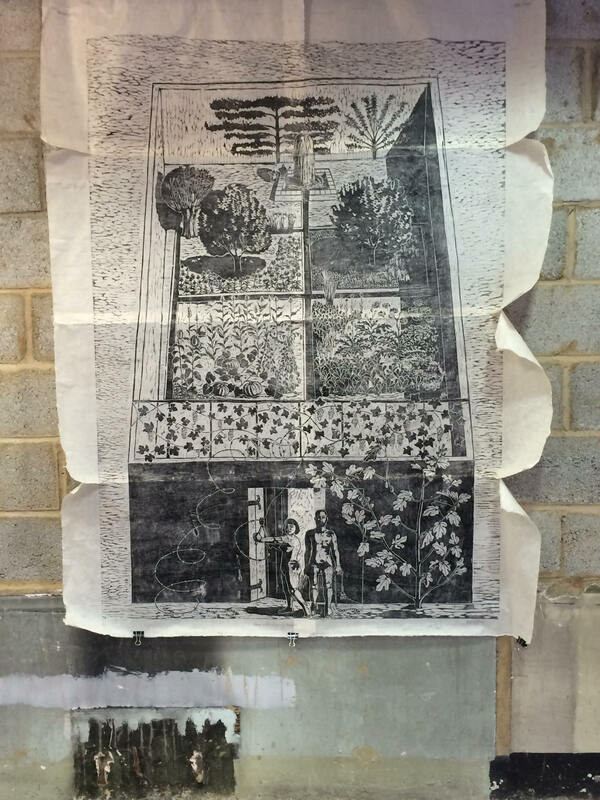 Although, being honest, add a frame to most of the rest of the work on view, and the same would absolutely apply. Bravo to Pascal, Alice, Olivia and all the artists involved on beautiful work and a spectacular show.